Hairy cell leukemia (HCL) is a rare and highly treatable B cell lymphoproliferative disorder. It is characterized by leukemic hairy cells of specific immunophenotype having strongly positive cytoplasm for tartrate-resistant acid phosphatase (TRAP), massive splenomegaly and very little or no involvement of lymph nodes. It is named HCL because of unique cytoplasmic projections of the malignant cell, the so called hairy cells. II. Diagnostic Confirmation: Are you sure your patient has hairy cell leukemia? HCL is diagnosed by its characteristic cells on peripheral smear but bone marrow biopsy is also needed to confirm the diagnosis. Hairy cells are mononuclear cells with prominent cytoplasmic projections which are easily seen on phase contrast microscopy, both in peripheral smear and bone marrow aspirates. Previously, TARP activity was used to confirm the diagnosis, but immunotyping by flow cytometry has replaced this diagnostic method. Like other leukemias, HCL can present with a variety of vague clinical features, but most common complaints are fatigue, weight loss and abdominal discomfort. Splenomegaly may be massive and can lead to spontaneous splenic rupture. Surprisingly, night sweats and fever, common features of other lymphoproliferative disorders, are not very common in HCL. If fever is present, a superimposed infection should be suspected in patients with HCL. Infiltration of bone marrow by leukemic cells usually suppresses one or more cell lines. This leads to specific signs and symptoms, including easy bruising and bleeding (from thrombocytopenia), recurrent infections (mostly due to granulocytopenias), and anemia. Patients may also present with symptoms from autoimmune disorders associated with HCL. Vasculitic skin rash is one of the more common associations of HCL. Some patients remain asymptomatic and are diagnosed when splenomegaly or cytopenias are incidentally found during evaluation of an unrelated cause. Overall, HCL is a very uncommon disease, and accounts for 2% of adult leukemic cases in the USA with estimated 600-800 cases each year. It is primarily a disease of middle aged men. HCL is more prevalent in males compared to females (4:1), and whites versus blacks (3:1). The exact etiology of the disease is unknown but several environmental factors such as Epstein bar virus infection, exposure to chemicals (especially agricultural pesticides), and radiation are thought to be inciting factors. Researchers have also noted genetic predisposition of HCL. While the pathogenesis of HCL is unknown, many studies have found an association between HCL and a V600E activating mutation in the BRAF signaling pathway. C. History Part 3: Competing diagnoses that can mimic hairy cell leukemia. Other small B cell lymphoproliferative disorders with splenomegaly may cause a diagnostic dilemma and should be differentiated from HCL. Predominantly, these include chronic lymphocytic leukemia (CLL), prolymphocytic leukemia and splenic marginal zone lymphoma. Other disorders such as systemic lupus erythematosus (SLE) and tuberculosis can also present with enlarged spleen and bone marrow suppression, mimicking HCL. HCL can be differentiated from all above mentioned disorders by appropriate history and physical examination, along with immune and TARP staining of peripheral smear and bone marrow biopsy samples. While hepatomegaly and lymphadenopathy are infrequent, splenomegaly is the most common clinical finding and a palpable spleen can be found in 80-90% of the cases. Suppression of cell lines can cause easy bruising and/or bleeding, recurrent infections, anemia and/or cachexia as presenting findings. In one of the recently published research series, anemia was the most common sign in 85% of patients with HCL. Close physical exam can also reveal nonspecific features such as vasculitic dermal rash, ascites, and pleural effusion. Rarely HCL can present as soft tissue infiltrations and autoimmune manifestations. Like any other leukemia, there is no characteristic physical finding that can confirm the diagnosis of HCL. However, a series of signs and symptoms can give clues to help make the diagnosis. If diagnosis is suspected, physicians should order complete blood count with differential and complete metabolic panel. While in most of the patients HCL affects one or two cell lines, almost 50% of the patients develop pancytopenia due to infiltration of bone marrow with leukemic cells. Other laboratory abnormalities include azotemia, abnormal liver function tests, and hypergammaglobulinemia. Lactate dehydrogenase (LDH) is usually normal. HCL is suspected when an increased number of mononuclear cells with hair like cytoplasmic projections (hairy cells) are seen on peripheral smear. Wright’s stained peripheral films can help to easily identify hairy cells. TARP activity also aid in the diagnosis. See Figure 1. Typical leukaemia cell in HCL. Despite the common misconception, TRAP activity is not specific for HCL and can also be seen in other conditions as well. Hairy cells can involve the bone marrow either in a diffuse, focal or in the interstitial pattern. Rarely, patients may present with hypo cellular bone marrow with a small number of hairy cells resembling hypoplastic or aplastic anemia. It is common for the bone marrow aspirate to result in a “dry tap” due to HCL-induced diffuse marrow fibrosis. Hairy cells are originally B-lymphocytes, so they express all B-cell antigens. CD markers can be used to differentiate HCL from other lymphoproliferative disorders. Details about CD markers is beyond the scope of this chapter, but characteristic findings of these cells include lack of CD5 (characteristic of CLL) and expression of CD103 (present on mucosa associated T- cells), CD11c (associated with myelomonocytic cells) and increased expression of CD19, CD20 and CD25. Imaging studies are usually considered as “wasted” tests. They are generally not needed and should not be ordered. In a few cases, abdominal imaging may need to be obtained for splenectomy evaluation. Once diagnosis is confirmed from peripheral smear and bone marrow biopsy, management strategy should be planned and discussed with the patient next. HCL is a slow growing non Hodgkin lymphoma and can be followed for months or years in asymptomatic patients without intervention. Literature review favors not treating asymptomatic patients as there is no advantage to early treatment. Indications for treatment include symptomatic splenomegaly, large or painful lymphadenopathy (rare), infections, constitutional symptoms such as fever, night sweats, fatigue or weight loss. These include absolute neutrophil count of less than 1000, hemoglobin less than 11, and/or platelet count less than 100,000. Historically, splenectomy was the first line treatment until purine analogues were introduced. With excellent response to purine analogues, splenectomy is now performed only in certain cases, such as severe thrombocytopenia or in case of splenic rupture. Given its indolent course, HCL almost never requires any urgent medical management. Rarely, long standing undiagnosed cases can present with life threatening emergencies. These include profound bone marrow failure leading to severe anemia, thrombocytopenia and/or neutropenia. In these cases immediate transfusion is indicated. Patients may present with serious infections, septic shock and life threatening bleeding needing immediate attention. Other rare complications include splenic rupture, which although rare, may cause severe abdominal pain and symptoms of hypotensive shock. Complete blood count along with imaging studies of the abdomen followed by surgical evaluation is recommended in these presentations. If splenectomy is required, immunization with pneumococcal, meningococcal, and Haemophilus influenza type b vaccines is recommended. If it is not possible to vaccinate patients preoperatively, immunizations can be given after the 14th postoperative day. There are no physical examination findings to assess appropriateness of management. Once treatment is started, hospitalist should watch for the usual complications of chemotherapy. Cladribine is the preferred first-line choice and is administered as single cycle of 7-day continuous intravenous infusion at a dose of 0.1 mg/kg per day. Another purine analog that is often used is Pentostatin. Both Cladribine and Pentostatin produce prolonged immunosuppression and decrease in the absolute numbers of CD4 and CD8. However, opportunistic infections are uncommon unless purine analog is combined with glucocorticoid in which case prophylaxis against pneumocystis carinii pneumonia is indicated. After splenectomy, complete blood count should be monitored. Peripheral blood counts return to normal in as much as 70% of cases, indicating good response to the treatment. Neutropenia is commonly associated with cladribine, so granulocyte counts should be closely monitored after administration of this chemotherapeutic agent. Usual side effects of chemotherapeutic agents such as pancytopenia, bleeding and severe anemia can also happen after administration of purine analogues and should be followed by series of blood counts. How often blood and neutrophil count should be monitored is not known and varies from patient to patient, but should be started soon after beginning therapy. In asymptomatic patients, spleen, lymph nodes and signs of pancytopenia should be closely monitored. Serial blood tests and physical examinations need to be done in these patients. Severity of constitutional symptoms should also be noted. There are no definite recommendation guidelines available about the frequency of these tests and follow-ups. Long-term management includes following the patients for any signs of opportunistic infections. Herpes Zoster infection is known to happen even after one year of treatment of HCL. Other opportunistic infections are not commonly associated with treatment of HCL. Attention should also be given to patient’s social issues and psychiatric outcomes associated with malignancy and its treatment. Many changes have emerged in the treatment of HCL over the last few years. Purine analogues such as pentostatin and cladribine are now commonly used in the treatment of HCL and have replaced splenectomy and interferon as initial agents of choice. Researchers have also tried interferon alfa either in combination or in cases of failure of purine analogues. Investigators are exploring novel therapies for HCL, including monoclonal antibodies directed against CD22, CD20, and CD25 in addition to BRAF inhibitor (vemurafenib). Side effects of treatment of HCL can range from nausea, vomiting and conjunctivitis, to severe thrombocytopenia causing life threatening bleeding, severe anemia requiring blood transfusions, granulocytopenia leading to opportunistic infections and septic shock, serious neurological toxicities and prolonged immunosuppression. Further details regarding the medications and dosage are beyond the scope of this chapter. Long term pitfalls include opportunistic infections, relapse of HCL and secondary malignancies. These include a wide range of malignancies ranging from skin to gastrointestinal cancers to other non-Hodgkin lymphomas. Whether HCL or its treatment increase the risk of these secondary malignancies is not clear. Treatment of HCL may need adjustment in patients with following medical comorbidities. Cautious monitoring of cladribine dosages is needed in cases of renal insufficiency. Dose of Cladribine should also be reduced when used in association with other nephrotoxic drugs. FDA has recommended cautious monitoring of cladribine dosages in cases of liver insufficiency, though definite goals are not known. No change in standard management. In cases of diabetic nephropathy, cautious monitoring cidarabine dosages is needed. Patients should be monitored for opportunistic infections (especially pneumocystis carinii infection) when glucocorticoid therapy is added to the chemotherapeutic agents. Patients with active infection need to be treated before initiation of treatment with purine analogues. Furthermore, patients who have received a purine analog have reduced cellular-based immunity for at least 9-12 months after completion of therapy and the addition of any other immunosuppressive agents during this period can further enhance the risk of infection. Severe pulmonary toxicities can occur with higher doses of pentostatin, its dose should be monitored cautiously in patients with underlying pulmonary disease. Pentostatin should never be used in combination with fludarabine, as cases of fatal pulmonary toxicities are well known with the use of two medications together. No change in standard management with cladribine noted in patients with underlying pulmonary disease. Chemotherapy with purine analogues can lead to severe gastroenteritis, so appropriate gastrointestinal care should be taken before initiating chemotherapy for HCL. In severe cases, peripheral nutrition and complete bowel rest may be needed. No change in standard management in patients with underlying gastrointestinal issues. Generally, chemotherapeutic agents are well known to cause severe thrombocytopenia, care should be taken during administration of these agents in the presence of underlying hematologic or coagulation issues. Dose dependent myelosuppression is also known to be associated with both cladribine and pentostatin. These drugs should be cautiously used in patients with known bleeding diathesis. No clear guidelines are mentioned regarding change of dose in this situation. In cases of severe dementia, prognosis and treatment plan should be discussed in detail with the family as complications associated with the chemotherapy may be far worse compared to observing the disease alone. No change in standard management in patients with psychiatric illness is known. In asymptomatic with new onset of abdominal pain, an overnight team should consider evaluation for complications of splenomegaly, such as rupture or infarction. If admitted after chemotherapy, the team may need to repeat red cell count with plan to transfuse with rapidly dropping red cell counts. Low threshold should be kept to seek for any opportunistic infection. Low platelet counts should also be closely observed with low threshold to transfuse in cases of rapidly dropping platelets or active bleeding. Generally, HCL doesn’t need to stay in the hospital, once admitted the anticipated length of stay depends on case-to-case basis. Discharge plan depends on the reason of admission. Once diagnosed, patients with HCL need to be followed closely. The frequency of follow-up is not known and depends on individual cases. Symptomatic patients need to be monitored more closely with plan to start treatment. Asymptomatic patients can be principally followed by primary care doctors in general medicine clinics, but also need follow-up with hematology and oncology specialists. Surgical consults should also be included in the plan of care in cases with severe splenomegaly and/or bulky/painful lymphadenopathy. Once treatment is initiated, a specialist can decide on further follow-up of these patients. Sole work-up of HCL can be done on outpatient basis, but if admitted it is better to obtain diagnostic tests such as peripheral smear and bone marrow biopsy. Flow cytometery and immunostaining should also be requested to expedite the process of diagnosis. Furthermore, imaging studies of the abdomen, if needed, should be requested before surgical clinic follow-up. In cases where compression of vital organs is suspected by large lymph nodes, imaging of the particular body part needs to be ordered as well. Basic tests such as transthoracic echo, EKG and chest x-ray should also be obtained prior to discharge from the hospital. Complete blood count can help a physician evaluate the underlying condition of the patient and can be requested before clinic visit. Hospitalist should also consider obtaining a central venous access before discharging symptomatic patients with a plan to initiate outpatient chemotherapy. Patients with HCL have near-normal life expectancy. In one of the studies, patients with hemoglobin of less than 10 and platelet count of less than 100,000 at the time of initiation of chemotherapy, had relapse-free survival of 9 years compared to 20 years for other set of patients. With the advent of purine analogues, the survival of patients with HCL have significantly improved and in one of the recent series was noted to be around 90% at five years. Older age and African American ethnicity were independent predictors of higher mortality. Patients and their families require extensive explanation and counseling to accept a “watch and wait” approach. Patients should be educated to monitor complications of HCL. Patient should be educated about signs, symptoms and complications of HCL. These include complications from pancytopenia, massive splenomegaly and lymphadenopathy near vital organs (rare). Patients should also be counseled about autoimmune associations of HCL. Education should be given to follow up with the primary care provider if any complications of HCL appear, or if HCL become symptomatic. Earlier identification of clinical manifestations can help prevent frequent admission and readmissions. Lembersky, BC, Golomb, HM. “Hairy cell leukemia: clinical features and therapeutic advances”. Cancer Metastasis Rev. vol. 6. 1987. pp. 283-00. Golomb, HM, Catovsky, D, Golde, DW. “Hairy cell leukemia: a clinical review based on 71 cases”. Ann Intern Med. vol. 89. 1978. pp. 677-683. Ergene, U, Ozbalci, D, Isisag, A. 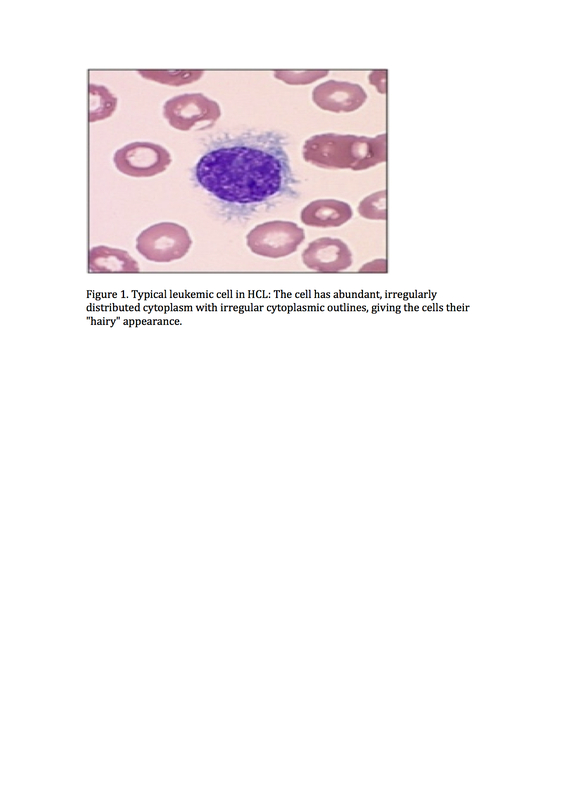 “Hairy Cell Leukemia and cutaneous involvement”. Transfus Apher Sci. vol. 46. 2012. pp. 231-2. Grever, MR. “How I treat hairy cell leukemi”. Blood.. vol. 115. 7 styczeń 2010. pp. 21-8. Dietrich, S, Glimm, H, Andrulis, M, von Kalle, C, Ho, AD, Zenz, T. “BRAF inhibition in refractory hairy-cell leukemia”. N Engl J Med. vol. 366. 24 maj 2012. pp. 2038-40.